Both members of the Guerillas of Destiny lost their first round matches on Night One, Roa to Yuji Nagata and Tama to Toru Yano. Tanga Roa himself noted during his entrance that it was his first singles match in the company, one that ended up being unfortunately average. I’m with the majority that attributes what quality there was to Nagata being in the match, as Roa showed nothing special beyond what he’s shown in tag team matches. There's certainly room to improve with him, but for now he hould be covered by his brother when possible. 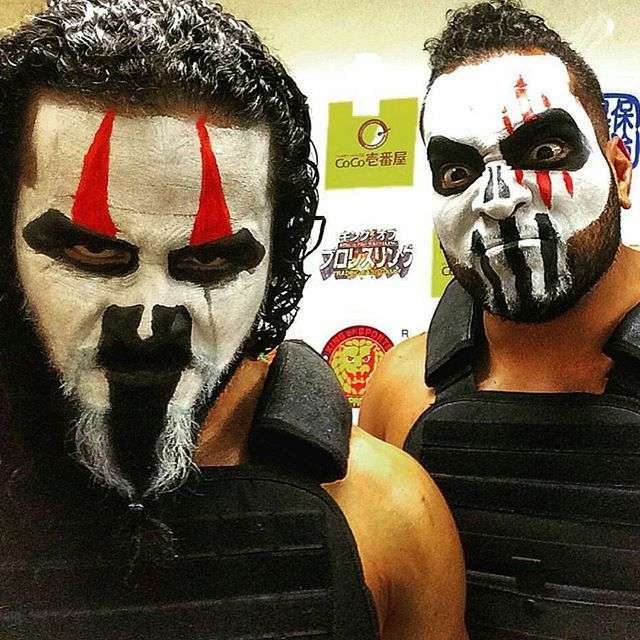 Tama Tonga’s loss to Toru Yano was much faster than his brother’s loss, although it was more entertaining per minute. It was the usual Sublime Master Thief schtick, and the two managed to compile all of Yano’s greatest hits into less than 5 minutes. I was hoping that we might see Tama Tonga advance farther in this year’s tournament, but it was not to be it seems. The final match of the night was by far the best, as EVIL scored one of the highest profile victories of his career by beating Hiroshi Tanahashi. Over twenty minutes of really good action that went back and forth, with the crowd energized and into the match the whole time. The one aspect of EVIL’s arsenal I’m starting to tire of is the complicated chair assault he performs in most every match he has. It’s still baffling to me what it takes for a man or a team to be disqualified in New Japan, and the blatant attack is always very jarring to see. 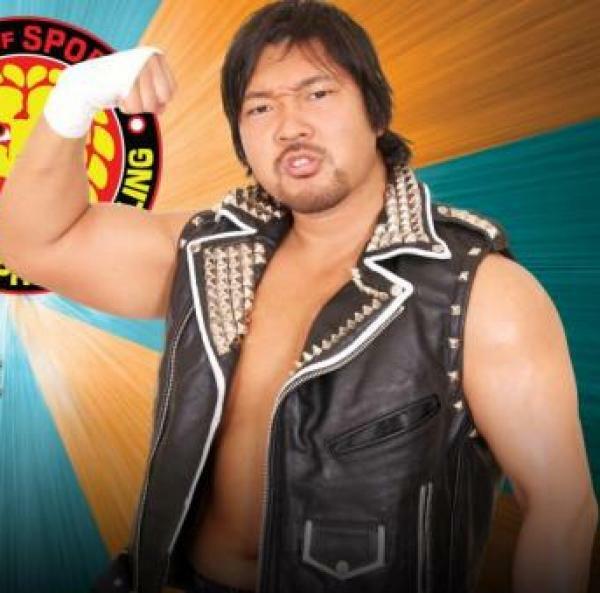 Other than that, I believe that the former Takaaki Watanabe will be a main event performer in New Japan’s future. The opening Tournament match of Night 2 gave what is possibly the best Yujiro Takahashi match I’ve seen since I started regularly watching New Japan. He and Juice Robinson managed to put together a really nice, fast paced match. Maybe he felt some figurative noose tightening based on the general consensus of his talent, maybe he felt like proving he’s better than the comedy finish of his first round match last year. Juice still got the win as his star continues to rise in New Japan. Gedo must see a lot of potential in him as a major gaijin babyface, and I really don’t blame him. Sanada and Yoshi-Hashi delivered what could be seen as a breakout performance for both men, While they’ve had arguably better matches, Sanada with Okada and Tanahashi, Yoshi with Naito and Omega, this match proved that each could deliver on an individual basis, and quelled any nay-sayers who would try and claim that the quality was a result solely of their opponents. There is also a built in intensity that the two share due to their real life past, which finally seemed to be used in this confrontation. Fast paced, with quick and clever counters from both parties to the other’s finish, and a great ending that saw Sanada delivering shades of AJ Styles with an Asai Moonsault into a standing Dragon Sleeper for a Skull End. A very good match that sadly got buried in a slew of excellent quality bouts in the first round. 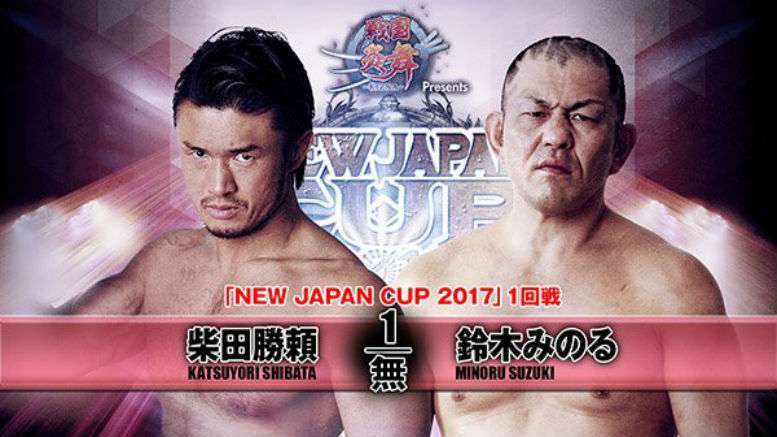 Katsuyori Shibata and Minoru Suzuki had what I can only describe as a worked shoot fight. Nothing was flashy, and no movement was wasted. It was everything that we were promised, but top me it was honestly underwhelming. Maybe if this match had happened in the semi, or even quarter finals, it would have better reactions, or maybe the point was for such little reaction, but for what it was it certainly wasn’t bad. I would love to see these two have a rematch and be given more time to get more out of what they’re given. Eventually, Shibata hit the closest thing to a PK out of nowhere, when he struck Suzuki with an open palm strike that sent him seated to the ground, which is a unique way to transition into the move. Still a very good match that I’ll have to go back and watch again, maybe I’m being unfair to the match. I loved this match like I thought it would, and it was possibly even better than I thought it could be. 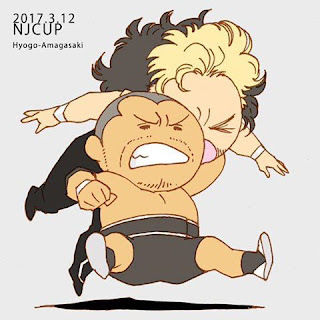 Kenny and Tomohiro’s personalities connected perfectly in this match. Kenny upped the intensity, bringing sharper strikes and a louder range of expressions than usual. Literally, I think he jaw jacked more here than in most matches. Ishii himself brought his usual offense of elbows, headbutts, and chops, but he managed to break out moves the likes of which we’ve never seen from him. Everyone is talking about his counter from Kenny’s shoulders into a Stunner, but my personal favorite remains the top rope Frankensteiner that he managed to bring out of his junior days (Seriously, did I dream this? Was I the only one who saw this happen because no one seemed to be talking about this). This match was one of the great classics of our time, easily a 4 3/4 star match that EVERYONE needs to see. 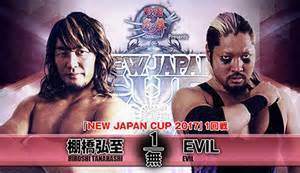 The only match that comes close to this one in the opening round is Tanahashi and Evil from the day before, and even that couldn’t stand up. Ishii got the win after just almost a half hour of back and forth fighting, using the Ishii Driver to secure what may have been his biggest victory not to happen in the G1 Climax. The second round of the Cup came up fast, especially for American fans. Unfortunately I haven’t gotten the opportunity to watch the quarterfinals personally. 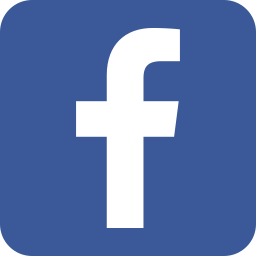 However, I am able to talk briefly on my reactions to the semi-finalists. Evil moved onto the semifinals and I’m elated. 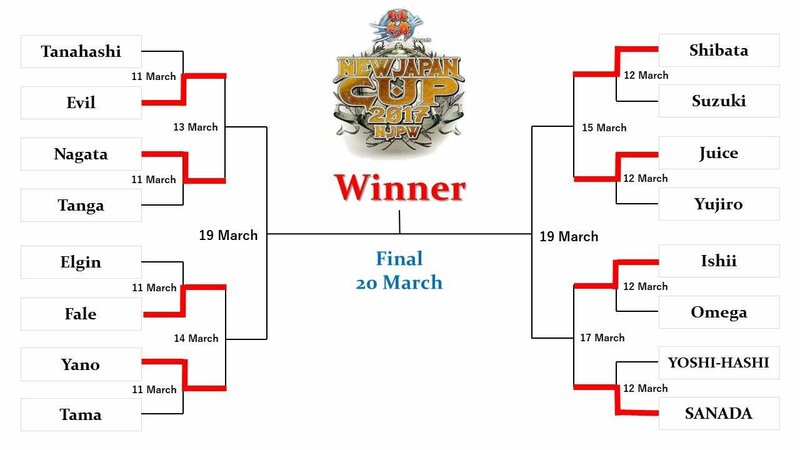 Not that Nagata isn’t good, but Evil has more to gain out of continuing on in the tournament, maybe now even possibly winning the whole tournament. I’m really excited for the him. Watanabe was technically one of the first New Japan wrestlers I ever saw wrestle. It's so far back, that I still still remember him as the slimmed down excursionist, with his stupid, studded jacket. Fale beat Toru Yano, in what I’m sure was plodding fashion. I assure you that I don’t go out of my way to bash Fale, but there’s only so much he can do, especially with Yano. Just glad that the Sublime Master Thief isn’t making it to the semi-finals this year. The Prospect of Fale and EVIL is an interesting one. I think this will be the ultimate test for the Los Ingobernables member. It’s easy to have a good match with Tanahashi or Okada, but getting a good match out of The Underboss will be a true test. I believe he can, and I can’t wait to see the knock down brawl. 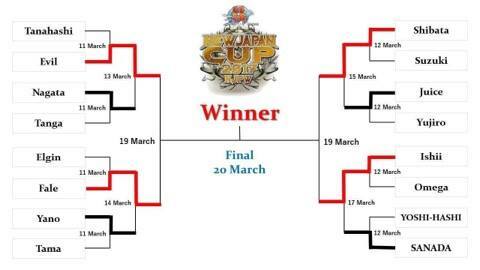 Katsuyori beat Juice, which was expected. Really not much to talk about between the two, nor is there a lot to talk about with Tomohiro beating SANADA in his quarter finals match. All I can really say at this point is thus; we’re getting Shibata and Ishii 6, and that makes me happy. If you need a reminder, or a primer, of what to expect, here it is. So, who’s gonna meet in the finals? 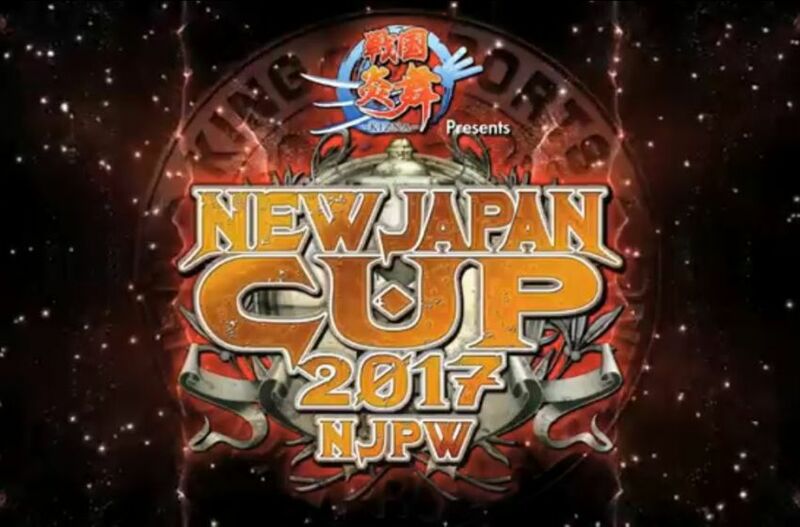 Whoise going to win the 2017 New Japan Cup? Well, we’re gonna find out, and the ride is gonna be awesome on the way.